October was another good month for New Horizons. On the science front, a team that included Project Scientist Hal Weaver and myself, along with mission science team co-investigators John Spencer and Leslie Young, mission science team collaborators Andrew Steffl, Marc Buie and Eliot Young, and Space Telescope Science Institute (STScI) scientist Max Mutchler, discovered that Pluto has two small (about 100 kilometers in diameter) moons orbiting just outside of Charon's orbit. 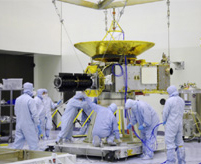 This is an exciting development for both planetary science and for New Horizons! And when we get to Pluto, we're going to have four separate objects to study - that's double the number we expected to study. It's a good thing that we put the software in back in 2002 to target multiple moons for observations! For more information on this exciting discovery, see www.boulder.swri.edu/plutonews. On the mission front, the spacecraft has been undergoing mission simulations and autonomy subsystem testing at the Cape . 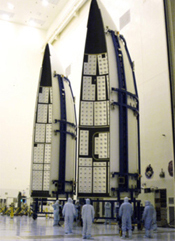 A number of final instrument tests were also run, and many of the internal bays of the spacecraft were cleaned and inspected for flight closeout. New Horizons at the Cape. Mission control at the Johns Hopkins Applied Physics Laboratory in Maryland has been busy as well, operating the spacecraft remotely as it will in flight. We have just over two months now until the launch window opens, and every practice session they can get - either on the spacecraft or the spacecraft simulator - is important. Our rocket is now assembled at the launch pad and our third stage is assembled and nearing its flight mating to the spacecraft. By early November, the final bits and pieces of the New Horizons flight hardware will be at the Cape. A nice surprise came in October with good news from the Department of Energy (DOE), which had completed their thermal vacuum testing of our radioisotope thermoelectric generator (RTG) at its fabrication and test facility in Idaho . When the final calibration of the RTG's output power was complete, we learned that the encounter power output would be 200 watts, which is a little higher than the 190 watts DOE had promised, and significantly higher than our 182-watt minimum requirement. This will allow us to run additional "hot spared" backup equipment during the encounter, and both REX (radio science) receivers during closest approach to the Pluto system. It will help out in similar ways at Kuiper Belt Objects. Go DOE! The big excitement of the last month for the team at Kennedy Space Center was Hurricane Wilma, which passed over Florida on Monday, Oct. 24. Fortunately, the Cape was well north of the centerline path. New Horizons and its ground support equipment were packed up and put in shipping containers as protection against roof leaks in the building where we're testing the spacecraft. Fortunately, the storm was easily weathered and none of our ground or flight equipment was damaged. All we lost was the few days of schedule time that it took to pack up, wait out the storm, and regroup. Over at the launch pad, however, a fabric door on the north side of the Vertical Integration Facility (VIF) was damaged by the wind. One of the solid rocket boosters was slightly damaged, but rather than have it recertified for flight, the team is replacing it with a spare. We don't expect any impact on the launch from this. During November, more mission simulations and autonomy testing will be performed on the New Horizons spacecraft and also on the spacecraft simulator. 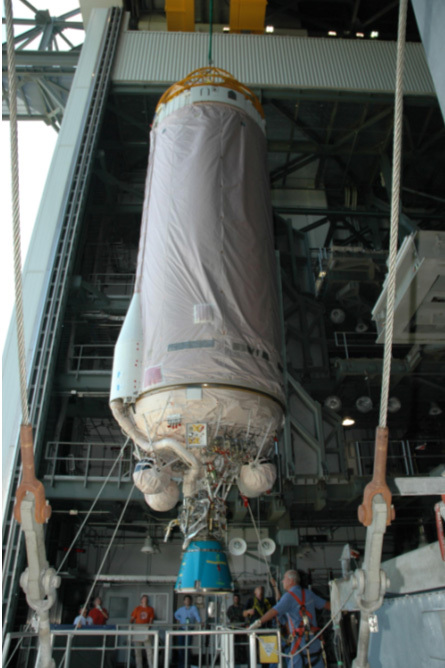 The engineering team will also perform the final spin balance tests and "dress" the spacecraft out for flight. Once the final spin balance mass is known, we will decide how much fuel we can fit into our tank. The tank can hold up to 80 kilograms of hydrazine. Our minimum need to safely reach Pluto is about 60 kilograms. Our present predicted fuel load is 69 to 77 kilograms, based on what models predict for the flight spacecraft and third stage dry mass. I'll let you know next month how much fuel we actually loaded. 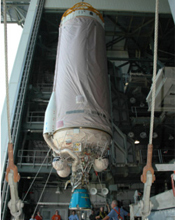 The New Horizons Centaur upper stage being lifted into position above our Atlas V in the Vertical Integration Facility (VIF) at Launch Complex 41. 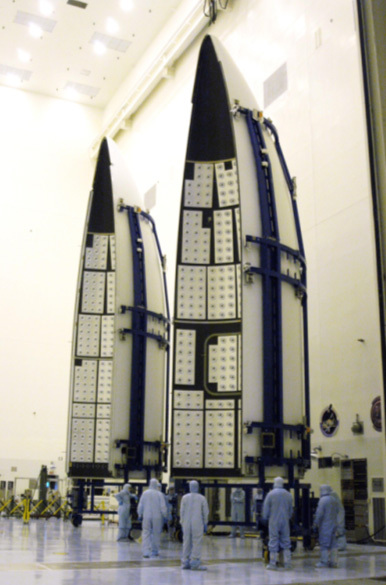 The huge payload fairings that will encapsulate the Centaur, our Boeing third stage, and the spacecraft at launch, at the Cape in early October.